This amazing architectural site was an addition to the itinerary with the second group. We flew from Mumbai to arrive in the state of Maharashtra. These 34 rock cut temples are on the UNESCO list of important ancient sites to be preserved. The oldest are Buddhist 7-8th C. next Hindu 7th – 9th C, and finally Jain 9-10th C carving. This was the chronological order of the history of these religions in India. This was one of the very hot Indian days when we visited. We climbed, walked , photographed, touched, and stood in awe of these ancient temples. It is amazing to be able to experience all this in a personal way. . . . touching, following dark entrances and ancient hallways. There were no restriction or barriers so unlike other places we have visited. We were there hours and hours in the hot sun, with no complaints. . . . just amazement! I am going out on a limb and encouraging either Indian people or visitors from the world to include these memorial caves. You won’t be disappointed. 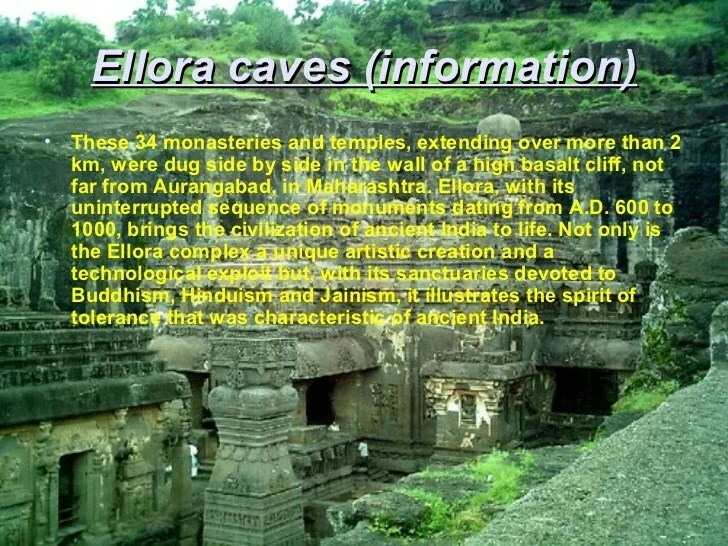 This first video is about Ellora and the second part is the site of Ajanta which is nearby but time pressing. We spent the whole day at Ellora! In the video you will see why ! Following is a post I did on Kailasa the largest and by far most spectacular of the temples at Ellora for those of you who are interested and who hadn’t seen it before. There are people who, not being able to understand it all have a theory that ancient aliens carved these temples. This entry was posted in Architecture, India, Religions of the World, Uncategorized and tagged Ancient rock cut temples, Buddhist, Ellora, Hindu, Indian temples, Jain, Maharashtra India, near Mumbai, photography, temples. Bookmark the permalink. Yes , I have visited this. It is marvel.. I would encourage everybody to see it and yes it is a marvel !